For awhile now we’ve been having “Breakfast For Dinner” on Thursday evenings here at my house. 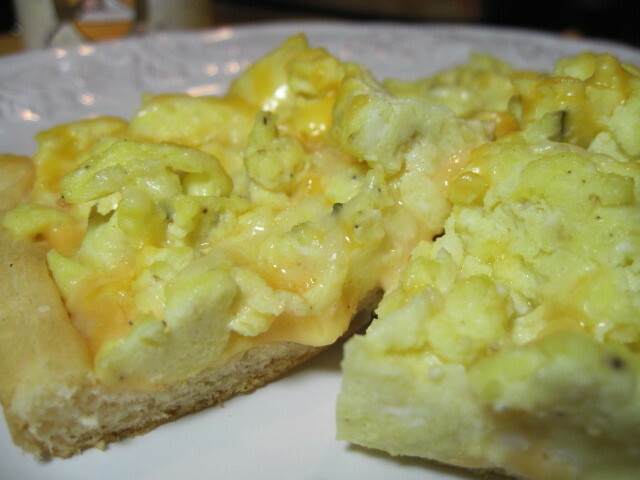 I’m a huge fan of scrambled eggs and this breakfast pizza highlights the scrambled egg in all their golden splendor. 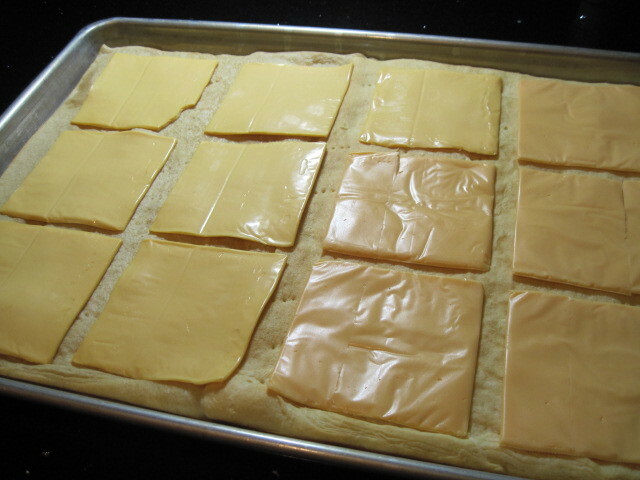 -Spray a 9×13 baking sheet lightly with cooking spray. -Unroll your crestent dough and press firmly into your baking sheet taking care to press all the seams together to form one uniform sheet of dough. 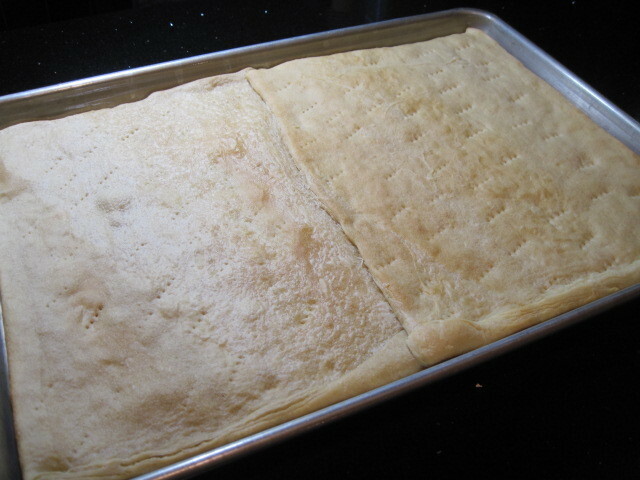 -Dock your dough with a fork so as your curst prebakes the crust will stay uniformly flat and not bubble up. -Prebake the dough for approximately 12 minutes. 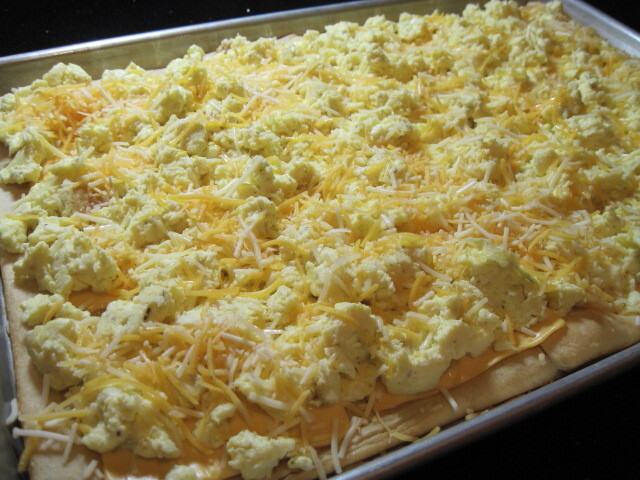 -Remove from the oven and allow to cool while to make your egg topping. 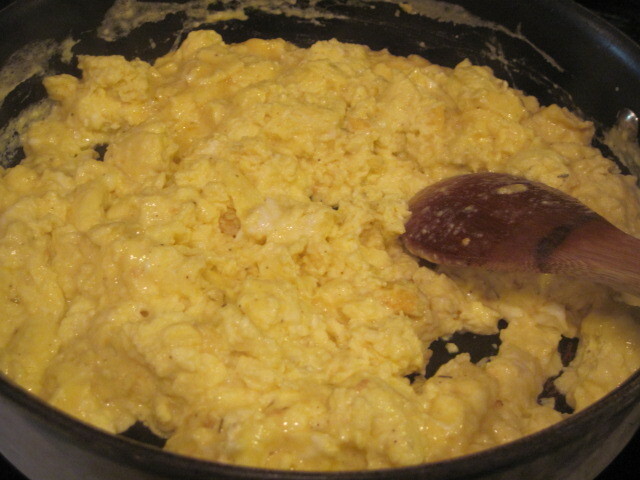 -In a large bowl, add the eggs, sour cream, milk, salt, pepper, dry mustard and thyme. -Whisk all the ingredients together until light and fluffy. -In a large skillet over medium heat, melt the butter and gently scramble the egg mixture until you reach a slightly wet consistency. You’ll still be baking the pizza off in the oven so you don’t need to fully cook the eggs at this point. 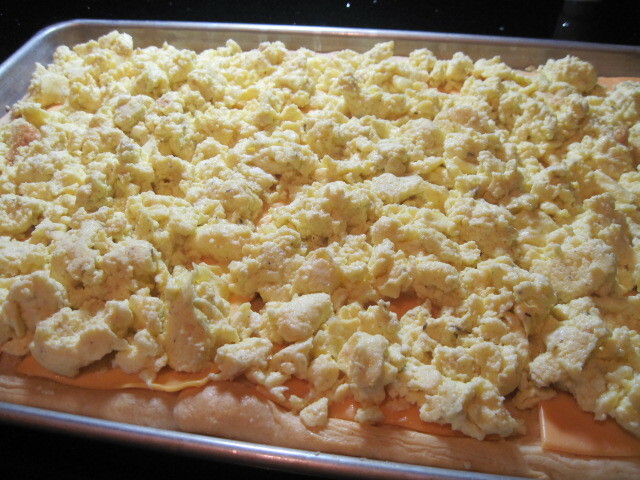 -Remove the eggs from the heat and set aside. -Prepare your crust by adding the American cheese slices evenly over the top of your prebaked crescent rolls. 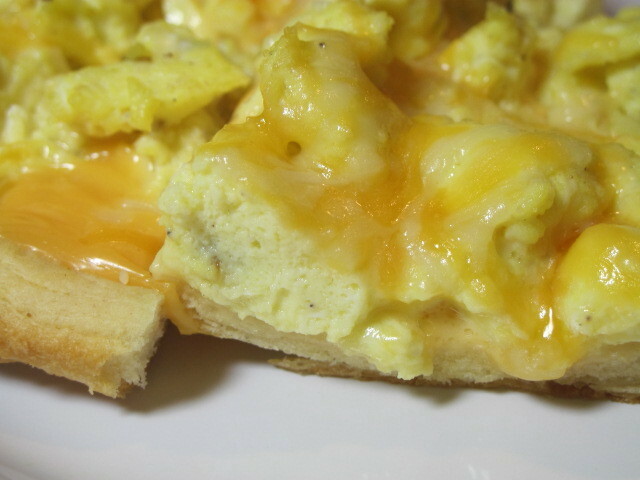 -Gently spoon your scrambled egg mixture evenly over the entire surface of the pizza crust and cheese slices. 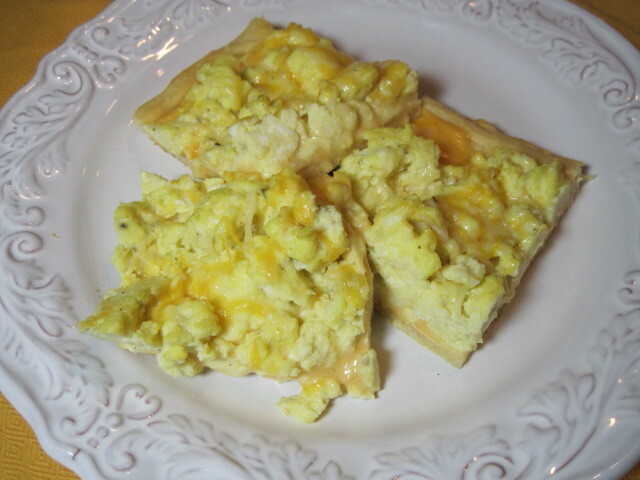 -Top the scrambled eggs with the shredded cheddar cheese. -Bake the entire pizza for an additional 10-12 minutes untile the crust is fully cooked and the cheese is completely melted. -Allow to cool for a few minutes (covered) and then slice as desired. Thanks for stopping by my Kudos Kitchen! Are Your Ready For Some Football? Yum! I just love breakfast pizzas. 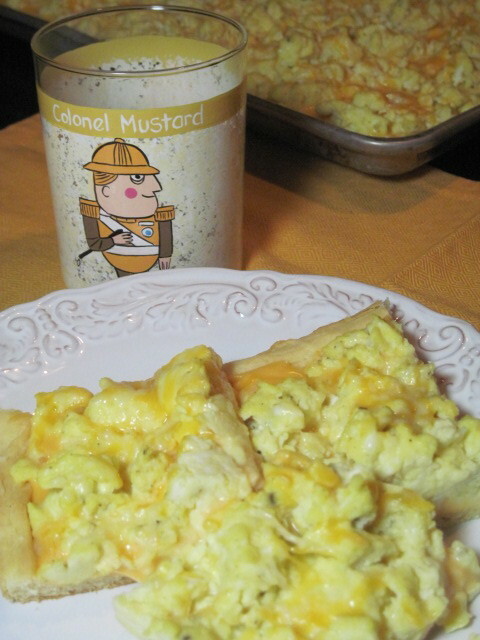 They're a fun way to serve the biscuits, eggs and cheese! I absolutely love this. Aren't crescent rolls marvelous? yum!!!! WHERE did you find the Colonel Mustard cup?? Hi Sheila. Glad you like the recipe. Thanks for visiting!